St. Andrew by the Sea has come together in miraculous fashion, so we believe that God truly has a purpose for us. As followers of Jesus, we believe that our purpose is to make disciples, beginning with ourselves. 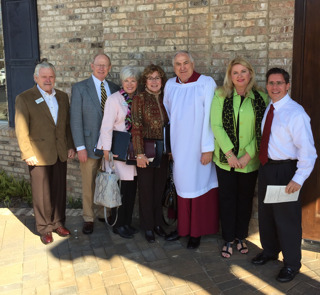 The particular focus of St. Andrew by the Sea is on our community. By that, we mean much of Baldwin County, for we serve people from Gulf Shores, Orange Beach, Foley, Elberta, Magnolia Springs, Robertsdale, Fairhope, and Daphne. Making a difference in Baldwin County is at the heart of our calling. We work closely with several outreach partners. Community also means bringing together the diverse Christian community, partnering with other local churches as often as possible. It means finding common ground to address real needs. Today, our church family is asking what God and the area need us to do. An informal Vision Team is working with elected church leaders and their committees to discern this calling. The Vision Team (Beth Craft, Perry Hand, Teresa Matherne, Bill Parks, Charles Runels, Sandy Schuchardt, Harriet Slaughter, and Fred Van Cor) meets most Mondays with Rev. Larry Wood. We're looking at ways to better serve children and youth, all through the week. Our vision includes more hands-on community service, programs for families, personal growth, mentoring, small groups, and lay caregiving. These conversations will involve all the church family, as well as many community partners. Please share your thoughts – it will truly take all of us to answer God's call.